At Last – An Affordable Real Sportscar! Everything comes to those who wait. So the saying goes. Well it came true for me when Toyota dropped off the Toyota GT86 sports coupe for me to test. Admittedly, the delivery driver had to unwrap his tall frame after exiting the driving seat of this very low slung machine! He promised I would enjoy the driving experience once I had climbed into the lowly driving seat of this menacing looking two-door machine. Wryly, I must admit that its presence on my drive indicated to me that this was a modern incarnation, without resorting to retro décor, of true serious sporting machines of about 50 years ago. An external examination reveals an aircraft style rear spoiler with uplifted tips, two massive chrome exhaust pipes and a front grille that could have been inspired from the Jaws film – it looked ready to devour! What fun this car promised and a glance at the specification showed that a great deal of imagination had gone into the GT86’s creation. The engine is a flat four-cylinder double overhead camshaft 2-litre Boxer design, extensively developed from a well proven Subaru basis that, without turbo charging, is capable of punching out 197 bhp at 7,000 rpm. This engine design obviously allows for a low bonnet line and is thus suited to a long slung body design. Of course, it has to have rear wheel drive if it is to cater for the serious drivers among us and a fast and accurate 6-speed manual gearbox. Accessing this car is a bit of an art though once into the high back sports-type driving seat the ergonomics work splendidly for all but the exceptionally tall of stature. Manual seat adjustment, tilt/reach adjustable steering column and excellent pedal location ensure a comfortable and really business-like driving situation. There is also some padding around the lower cabin area to cosset the front occupants, especially when the firm suspension has to cope with poorer road surfaces. Fire it up! That’s literally what happens when the engine barks into life – undoubtedly a glorious sound for the die-hard enthusiast. A light but short clutch action introduces a memorable experience. This car has the potency to pin you back in the seats if the power is optimised…and what an experience that is after all the smooth and sanitised cars one usually drives! This really is a car that one needs to hire a race track for. It is claimed to hit 62 mph (100 kph) in 7.7 seconds and is said to be good for 140 mph but it is between those two performance figures that the real entertainment can be had. Work that gearbox, keep the power ‘on the cam’ and it is a real adrenalin experience. Admittedly around town one can discern a reluctance to docility, so aim to keep this one in an element of clear and more interesting roads but don’t get carried away by the performance potential where conditions and legislation restricts, it is very easy to go faster than you realise. The driving performance is that of a fine instrument – predictable, responsive and very capable, qualities that are hard or near impossible to replicate in a car costing around that of an average mid-range mainstream product. O.K. the GT86 can be described as a selfish car in so far as it provides a pair of rear seats of such minuscule dimensions that I dared not try myself unless I became stuck. The luggage compartment is shallow but goes back quite a way and the rear seat back flat fold as one piece, thus providing sufficient load space to qualify the car as a Grand Tourer. There is provision for child seating. Subaru’s Boxer engine range had, some years back, struggled to reach strongly competitive fuel economy figures (I will shortly be reporting on their latest and best example) and one would expect the GT86’s turn of performance to guzzle up the precious liquid. Actually, it's not bad, the claimed combined figure is 36.2 mpg and unless one undertakes some serious track use I suggest that 30 mpg is ‘on’. It indicates that the employment of Toyota’s direct fuel injection system has made an important contribution. Clearly this car is a reminder of times gone by when it comes to raw performance, this sporting Toyota is also pretty civilised, featuring items like dual zone air conditioning, cruise control, retractable heated exterior mirrors, push button start/stop, multi information display with analogue/digital instrumentation, LED lighting with daylight running, powered front windows and remote locking etc. Options included touch screen audio/infotainment, satellite navigation, Blue Tooth, USB port, leather upholstery and a (necessary) rear view camera. 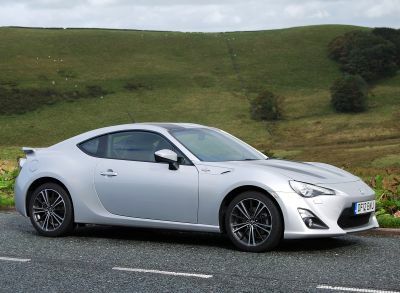 Toyota is renowned for creating cars that satisfy a lot of people and now with this highly exciting GT86, this ever forward thinking car maker has come up with a gem of a car that will certainly satisfy a fortunate few. It has been a long time since I have had so much motoring fun! MAIN RIVALS: Peugeot RCZ GT, VW Scirocco 2.0 TSI, Renault Megane Cup, Nissan 370Z.